Collard greens are a staple in soul food cooking, and in this recipe, simmering the greens in a pork broth really intensifies the flavor. 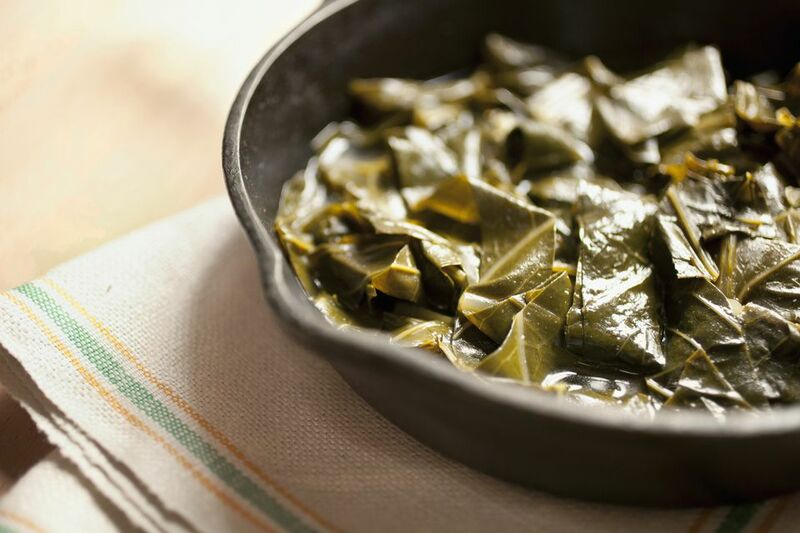 To make preparing this dish easier, try and find washed and chopped collard greens in the supermarket. These bags eliminate the hassle of washing and removing the stems of each collard green leaf. If you can’t find the bags, strip the leaves to remove them from the center ribs before washing and chopping. Add ham hocks, pigs’ feet (optional), bacon and garlic to large pot, and cover with 12 cups of water, or enough water to cover pork products. Bring to a boil over high heat; reduce heat to low and let the pork stock simmer for 2 hours. Check occasionally and stir. After pork stock has cooked 2 hours, carefully remove ham hocks and pigs’ feet to bowl. Let cool and remove any meat from pork products. Meanwhile, season pork stock with salt to taste. The amount of salt needed will depend on the saltiness of the pork products used. Increase the heat to high so stock is boiling. Drop the collard greens into the boiling stock in bunches, stirring so the greens are wilted until all the greens are in stock. Reduce heat to low again, and let the greens simmer in the stock for 30 to 45 minutes. Add sugar and reserved meat from ham hocks and pigs’ feet to collard greens. Season to taste and serve collard greens using a slotted spoon.